Mt. Elon Baptist Church was founded in 1831 in the small town of Lydia. The present church building was constructed in 1911 and was built by Lucius Patrick Raines. The congregation derived its name from the plentiful oak trees which surround it. Elon means “oak” in Hebrew, and the tree is also a symbol of strength. The original church members originally met in other church buildings until they were able to build one if their own. Construction on a church for the growing congregation began 1858. Though the sanctuary was in use by 1860, it was not actually completed until 1870. It served the congregation until this church was built in the early twentieth century. Below is an article that was contributed to the South Carolina Picture Project by Bill Segars of Hartsville. It originally appeared in his local paper, The Darlington New & Press. It was published in October of 2015. Very often buildings are an indicator of the community and the time in which they were built. Time has proven that church buildings are an excellent measuring stick for the growth or decline of a community. When you understand the big picture, there’s no better church building that exemplifies this better than Mt. Elon Baptist Church at 1132 West Lydia Highway in Lydia. If anyone thinks that Lydia is “out in the county” today, try to imagine what the area was like in 1831 when this Baptist church was first established among a predominately Methodist population. Today’s United States Highway 15 was a dirt stagecoach road from Darlington to Camden and the only structure even seen from the trail was a tavern for the weary stagecoach passengers. That was it, there was no “Lydia.” But on June 12, 1831, 24 males, 30 females, 8 male slaves, and 15 female slaves gather together under a bushy arbor to form what would become Mt. Elon Baptist Church. Growth, as it was, proved to be slow but constant. According to Horace Rudisill, Darlington County Historian, any church building that the group used seemed to be inadequate until 1858 when a suitable building was built. Even that building’s interior was not completed until 1870, when the membership totaled 104. “Lydia” was first identified when the post office opened on January 31, 1856. Even through the War between the States, the area continued to grow. By 1870 a store was built, selling everything that locals needed. Dr. Jonathan Miller hung his shingle out as Lydia’s first physician. Unlike the neighboring Reconstruction communities, Lydia was booming – progressing so much, in fact, that the town needed a second doctor. When the first railroad tracks were laid from Timmonsville to Lydia in 1881, Mt. Elon’s membership had increased to 160 members. Unfortunately, due to underfunding, this locally-owned rail company only lasted for two years. Mt. Elon continued to grow, and by the turn of the century the congregation began talking about a new building. In 1910, with a membership of 248, negotiation began with a local carpenter, Lucius Patrick Raines, concerning the construction of the new wood framed, lap siding, church building. For the avid “Church of the Week” readers, does the carpenter Raines’ name ring a bell? 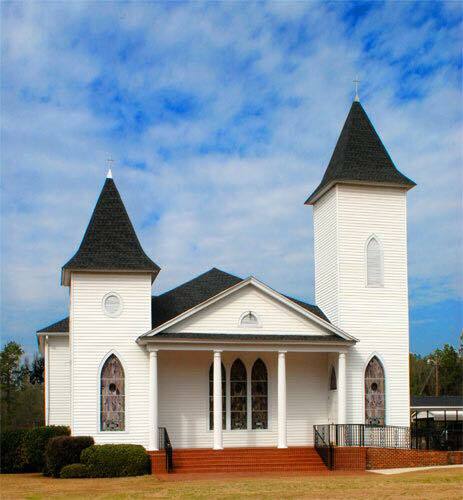 “That pretty white church with the red roof” on Ebenezer Road in Florence County, Pisgah United Methodist Church, was completed by Lucius Raines in 1914. The members were not only God-fearing Baptists, they also believed in “paying as you go.” The reported $10,000 cost of the new building was on hand, except for $3,250, which was pledged by the members to be paid. The ladies of the church were glad to do their part with a fund raising musical play. Admission of 25 cents was charged at the door, and for those who were concerned about not being able to find a seat, they could pay 40 cent for a reserved seat. The proceeds of $37 went towards paying for the carpet in the sanctuary. The 1858 church building was moved a short distance to the right to serve as a parsonage. While the church building was under construction, the congregation worshiped at the Una Academy. The Baptist Courier reported after Mt. Elon’s first service in the new Carpenter Gothic building on September 17, 1911: “There are few country churches anywhere equal to this in handsome appearance and excellent equipment. The building has an inclined floor, beautifully carpeted, with most approved seats, and has eight good class rooms.” I’m not real sure exactly what “most approved seats” means, but take it from one who has twisted and turned for a hour-long service seated in 1700 and 1800-era straight back wooden box pews: “most approved seats” must mean “most comfortable seats.” At the time of construction, Mt. Elon was the fourth most valuable church in the Welsh Neck Association, behind Hartsville First Baptist, Darlington First Baptist, and Black Creek Baptist churches. As fate had it, when Mt. Elon’s new building was completed, Lydia began to experience its second growth spurt. By 1913 the Seaboard Coastline Railroad between Hartsville and Bishopville was completed, bringing passengers and taking cotton to the mills. Land was subdivided for home sites, a bank was organized and built, and a number of retail stores were built to serve the needs of the new village. After Lydia was incorporated on August 20, 1913, a mayor was elected and a policeman was hired. With a policeman, the town must have a jail, so a brick jail was built. That building still exist today; I’ll challenge anyone to find it, and no, it’s not the small brick building on the west side of Indian Branch Road where a man has been burning trash for years – that’s the bank vault. The church’s debt was a big concern for the hard-working members of Mt. Elon. Even though their debt-to-value ratio was very low, they didn’t like to owe anyone and expected all members to pay their part, or at least what they originally pledged to pay (that’s not asking for much is it?). This issue came to a head at the January 1913 Church Conference meeting when the names of the delinquent members were read aloud. The Treasurer was instructed to notify each of them and collect the money within 60 days or “…if they don’t pay up by then the church will deal with them…” The total indebtedness was not paid completely, but $1,110 was collected. The members’ nonpayment of pledges continued to be of a concern to the Church Conference. By the end of 1913, Mt. Elon experienced its greatest loss of membership to date. Thirty-two members were suspended for failure to contribute. What do you think, was the church serious about their indebtedness issue or not? On April 6, 1917, the United States entered World War I. For the balance of that year, the economy was good. The agricultural-based Lydia community was prospering with sales of goods for the war efforts. Cotton was bringing 40 cents per pound, the highest price since antebellum days. Interesting side note: cotton closed October 16, 2015, at 62.14 cents per pounds; that’s only a 55% increase in 98 years. Think about that when you slip on your 100% cotton blue jeans next time. Anyway, on November 4, 1917 these prospering times were pointed out from the pulpit, and it was suggested that today was the day to settle the debt. Within 30 minutes, $1,400 – $200 more than needed – was raised, and Mt. Elon was debt-free and happy. For those of you who have been to Mr. B’s restaurant for lunch lately, you see that “Happy Days” don’t last forever. The Depression of 1929 and the “Hoover Days” of the 1930s hit Lydia hard. The bank closed, and eventually so did every retail business. The only two entities of the original “downtown” Lydia remaining today are the Post Office and Mt. Elon. There is another structure on the outskirts of Lydia that has survived and flourished. Can you guess what it may be? Surprise, surprise, it’s a church. Pick up a News & Press next week for its history.